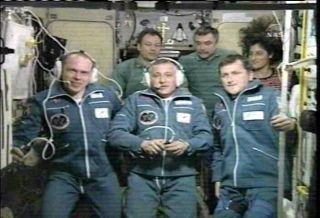 The six-member ISS crew during a conference call with Russian ground control shortly after Soyuz docking. After a two-day orbital chase, a Russian Soyuz spacecraft carrying an American billionaire and two professional cosmonauts caught up to the International Space Station (ISS) Monday, where its arrival was hailed by the outpost's three-astronaut crew. The Soyuz TMA-10 vehicle delivered U.S. entrepreneur Charles Simonyi, Expedition 15 commander Fyodor Yurchikhin and flight engineer Oleg Kotov to an Earth-facing berth on the space station's Zarya control module at 3:10 p.m. EDT (1910 GMT) while both spacecraft floated above the Ukraine. Following an earlier than expected hatch opening at 4:30 pm EDT (2030 GMT), the three Soyuz crewmembers entered the ISS, where they were greeted by astronauts on board the space station and congratulated by American and Russian dignitaries on the ground. "I made about three or four handwritten pages of notes," Simonyi said from inside the Zarya control module. "I'm very anxious to transcribe them. I wrote down practically every interesting moment of the flight." American TV personality Martha Stewart was also present in the Russian ISS control center in Korolev, Russia to offer her personal congratulations to Simonyi. "I want to thank your two captains for such a safe and beautiful trip," said Stewart, who is a close friend of Simonyi. "I just want you to know that we all think you are intrepid, a pioneer, and above all...you're out of this world." Yurchikhin and Kotov are due to relieve ISS Expedition 14 commander Michael Lopez-Alegria and flight engineer Mikhail Tyurin, who are nearing the end of a six-month mission to the orbital laboratory, during an 11-day series of crew change activities. The cosmonauts will also welcome current Expedition 14 flight engineer Sunita Williams into their Expedition 15 ranks. "Handover time is a very expressive and very difficult time," Yurchikhin said before launch, adding that he hopes to draw on Williams' orbital experience to help make the transition between ISS crews flow smoothly. After handover activities are complete, Lopez-Alegria and Tyurin are expected to return to Earth with Simonyi aboard their Soyuz TMA-9 spacecraft on April 20. "I hope we do a good job," Yurchikhin told SPACE.com before flight. Yurchikhin and Kotov hope to see two new crewmates rotate in during their Expedition 15 mission. NASA astronaut Clayton Anderson is due to replace Williams later this summer during the U.S. space agency's STS-118 shuttle flight. Fellow NASA astronaut Daniel Tani will then, in turn, relieve Anderson during the space agency's STS-120 shuttle mission later this year. But both of those shuttle flights must wait until after NASA's delayed STS-117 mission. A former Microsoft software developer, Simonyi, 58, has had a lifelong fascination with spaceflight that began during childhood while growing up in Hungary, where he represented his country as a Junior Astronaut on a trip to Moscow at age 13. He is paying between $20 million and $25 million for the experience, under a deal between the Federal Space Agency and the Virginia-based firm Space Adventures, which has brokered orbital spaceflights for the last four private visitors to the high-flying laboratory. An accomplished aircraft pilot, the U.S. entrepreneur hopes to perform a series of experiments and speak to students while flying in space. "I never thought I would have the opportunity of participating this closely," Simonyi said of his spaceflight before launch. "When this opportunity came up, I thought that this was very important and unique, and I thought I had to do that so that I can learn in the greatest details how the systems ...and so that I can share some of these experiences through the Web site and other means." VIDEO: Space Tourist Charles Simonyi in Zero G!